Yvonne Butler sent this postcard which shows a rural scene and was postmarked 1906. "Does anybody know exactly where this is; is it Trumpers up by Boston Manor? My nans gt uncle came back along there,his career was in Poplar Docks as a lighterman master. He retired and came back home age 71. He had started out from Brentford and got his licence master from Chiswick." 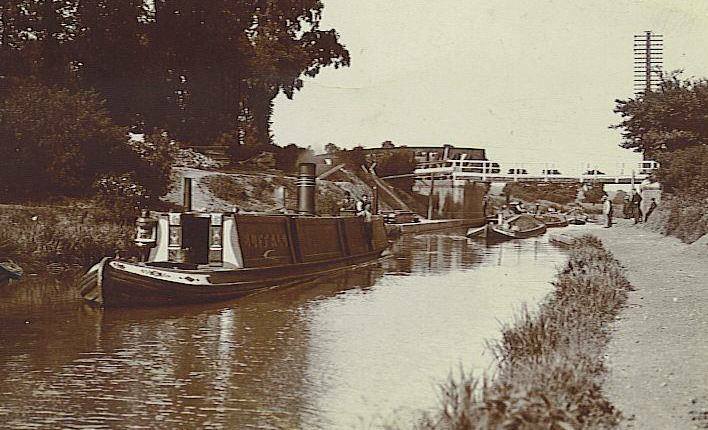 The scene features a barge (name not clear), other boats, a towpath to the right, a prominent telegraph pole and a footbridge crossing the canal; in the background is a building. If you recognise this location please get in touch, I will forward to Yvonne.